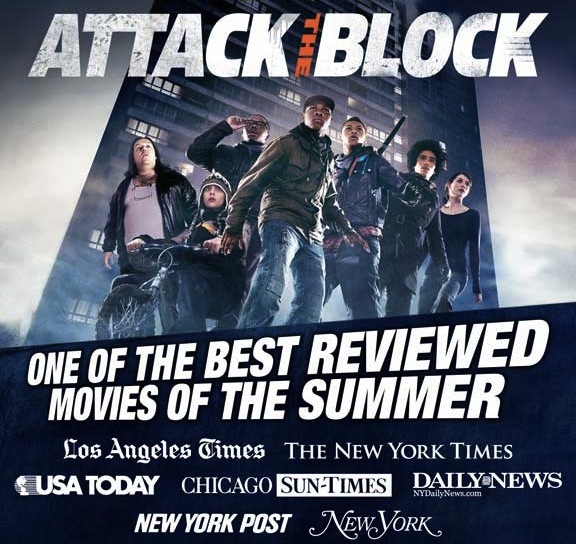 Despite being consistently reminded of the overwhelming mound of coverage aimed at Attack the Block this year, I’m still reading responses to the box office and columns and such from people that have only just heard about the film. That’s a shame, and some indication that an old school media campaign is irreplaceable– the internet is just too noisey to fill that marketing role alone. Also, the fact that people who have heard about the film are encountering troubles making a screening before the film splits from their theaters indicates to me that the studio hasn’t been behind the film enough to make it a hit in a real way. That felt like the case in Atlanta, where a mere week of showings at one theater made it very difficult to catch. In any event, I’m not going to fully autopsy the situation here, as I’d rather just let some newly lucky people know that the film is near them. These dates/places comes from producer Edgar Wright himself, dig through it and see if one of the theaters is near enough that you can catch one of the best films of the year, featuring one of the most interesting new actors of whom you’ll be seeing more soon. This does represent a relatively large expansion, and I believe puts the film in more theaters than in its 6-week run so far (66).